Cebuana Lhuillier is open to partnerships to help other businesses grow and to serve more individuals. Allow us to assist you in achieving your business goals while enjoying the following benefits. We offer a money disbursement service through our close to 2,500 branches nationwide for your company’s employee salary, monetary bonuses/incentives, money distribution, and other corporate disbursement needs. We can act as your company’s collection depository for businesses who are engaged in distribution and collection. Most ideal for unbanked or underbanked areas, this service enables businesses to conveniently collect from outlets through Cebuana Lhuillier branches nationwide, assuring secure and timely remittance each time. Let us help your business make it easier for your customers as we serve as your payment gateway system to enable your online shoppers pay their purchase at any Cebuana Lhuillier branch. With PeraPal, Cebuana Lhuillier serves as a third party that collects payments for online sellers. The service is especially useful for customers who prefer to pay in cash in lieu of a debit or credit card. Let us be your official bills payment station partner and extend our convenient, fast, and safe transactions to your clients. 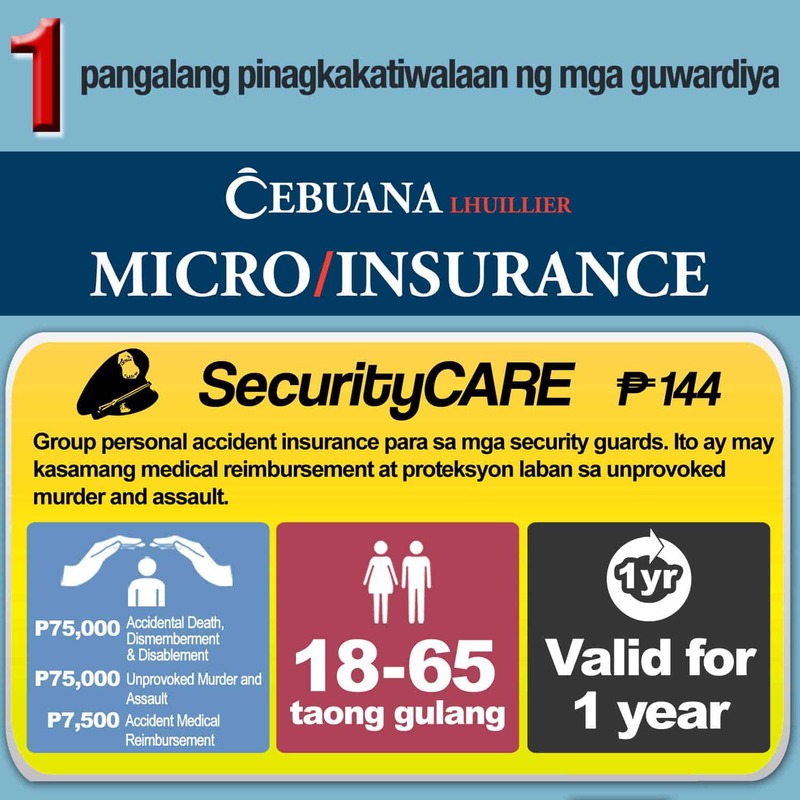 At present, Cebuana Lhuillier is a trusted bills payment partner of major telecommunication networks, insurance companies, online businesses, and schools, among others. Cebuana Lhuillier serves as an additional point of sale for telecommunications networks through its e-load services. With more than 2,000 branches nationwide, we can help make your prepaid loading products accessible to customers. With an expansive portfolio of products relevant to different institutions, Cebuana Lhuillier helps you address the needs of your business. We have a range of affordable insurance products that are of value, especially on unexpected circumstances. The insurance premiums are easy on the pocket while claims restrictions are kept to a minimum and requirements are simple to understand. 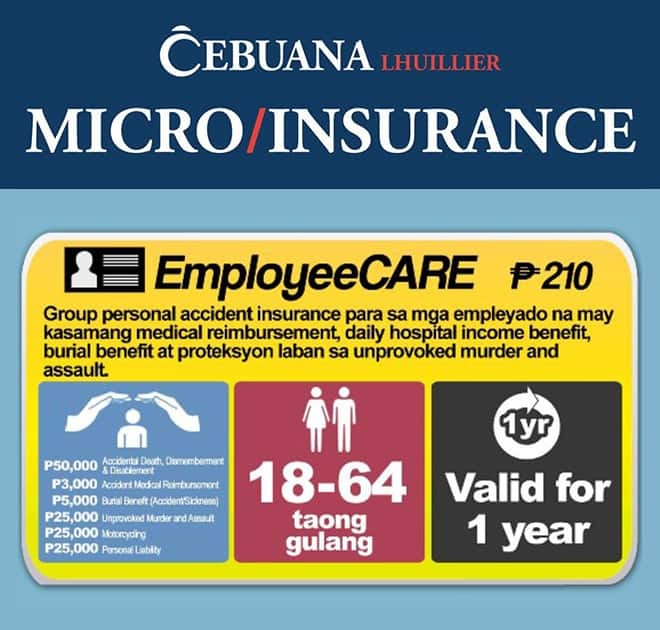 EmployeeCARE is a Group Personal Accident Insurance specially designed for employees. It covers Accidental Death, Disablement & Dismemberment (ADD&D), Accidental Medical Cash Aid, Burial Benefit (Accident/Sickness), Unprovoked Murder & Assault (UMA), Motorcycling and Personal Liability. SecurityCARE is a Group Personal Accident Insurance specially designed for Security Guards and officers. It covers Unprovoked Murder & Assault (UMA), Accidental Death, Disablement & Dismemberment (ADD&D), Accident Medical Reimbursement (AMR), Burial Benefit (accident/sickness) and an optional cover for Accident Daily Hospital Income (DHI). 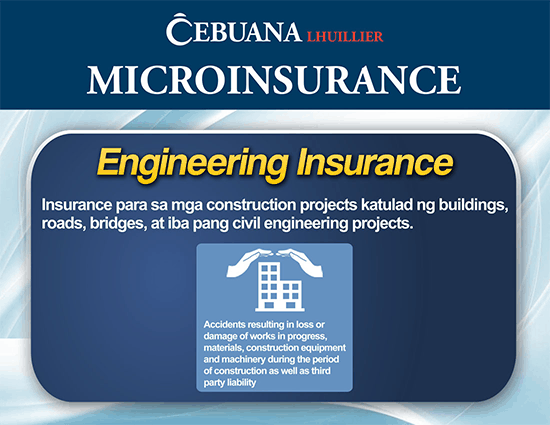 Engineering Insurance insures construction projects such as buildings, roads, bridges and other civil engineering projects against accidents resulting in loss or damage of works in progress, materials, construction equipment and machinery during the period of construction as well as third party liability. 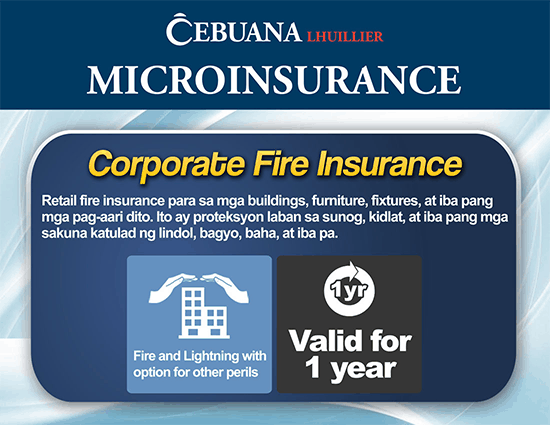 Retail Fire Insurance provides loss protection to buildings including furniture, fixtures, and fittings against fire, lightning, and other allied perils like earthquake, typhoon, flood, etc. 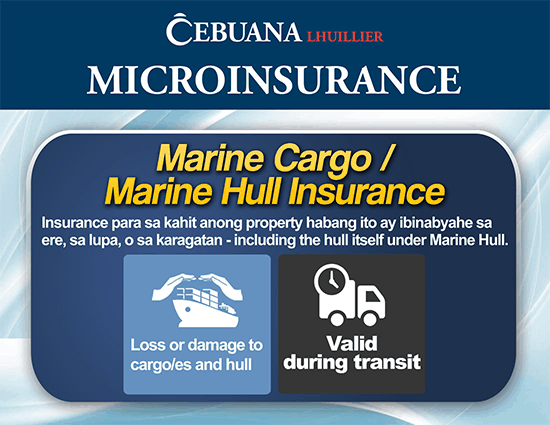 Marine Cargo or Hull Insurance offers protection to any property whilst in transit by air, land and sea. 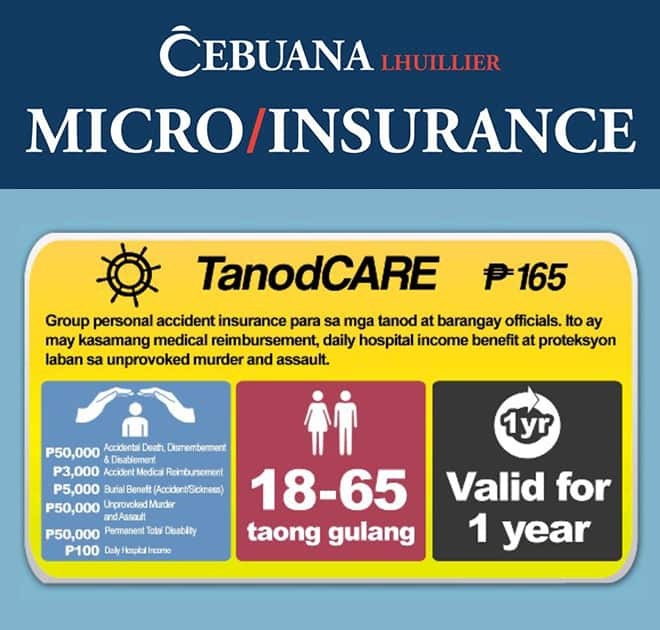 TanodCARE is a Group Personal Accident Insurance specially designed for barangay tanod officials and its members/personnel. It covers Accidental Death, Disablement & Dismemberment (ADD&D), Permanent Total Disability (PTD), Unprovoked Murder & Assault (UMA), Accident Medical Reimbursement (AMR), Burial Benefit (accident/sickness) and Accident Daily Hospital Income (DHI). This insurance requires a minimum number of 30 enrolees aged 18 to 65 years old, Enrolees above 65 years old will be accepted subject to 50% cover of Sum Insured for all Benefits. 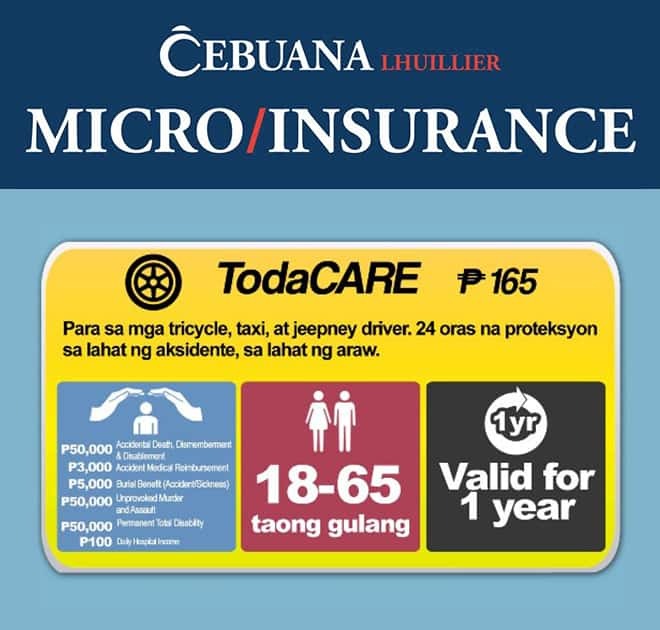 TODACARE is a Group Personal Accident Insurance specially designed for transport group leaders, officers and members. This insurance requires a minimum number of 10 enrolees aged 18 to 65 years old, Enrolees above 65 years old will be accepted subject to 50% cover of Sum Insured for all Benefits. 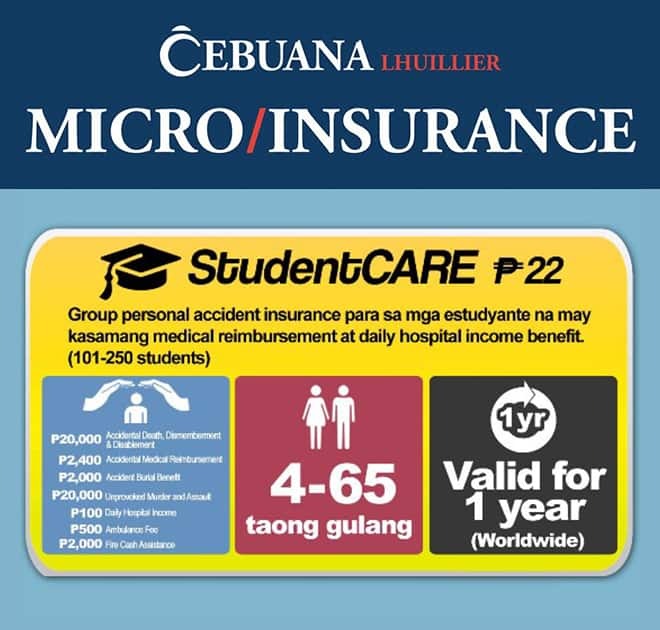 StudentCARE is a Group Personal Accident Insurance that protects students from various perils 24/7 worldwide. It covers Accidental Death, Disablement & Dismemberment (ADD&D), Accidental Medical Reimbursement (AMR), Unprovoked Murder & Assault (UMA); Accident Burial Benefit (ABB), Daily Hospital Income (DHI); Ambulance Fee and Fire Assistance. 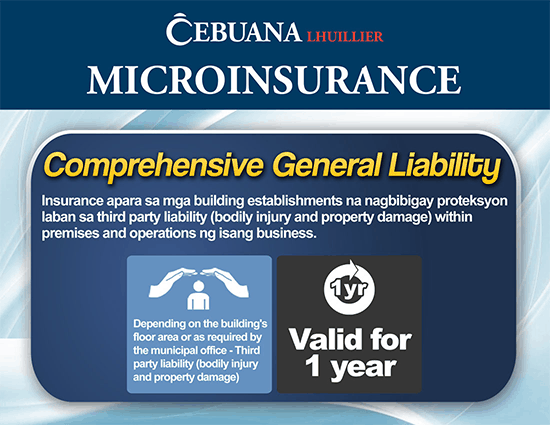 Comprehensive General Liability (CGL) Insurance is a comprehensive coverage on building establishments for third party liability (bodily injury and property damage) within premises and operations of a business.